It may have taken professional auto industry analysts some time to understand the impact of autonomous vehicles. But now Morgan Stanley’s Adam Jonas has come up with another ingenious 2-by-2 chart so much en vogue with international strategy consultants which highlights the core transformative forces at work. This is a major intellectual feat because it compresses the problem space and helps reason about changes, challenges and opportunities associated with self-driving cars. The chart is shown below. Because I don’t have access to the original Morgan Stanley report the following explanations may not exactly reflect Morgan Stanley’s reasoning. Quadrant (1) shows the auto industry today which is exposed to to major forces of change: The sharing economy leads to the emergence of companies which provide mobility as a service. Uber, Car2Go, DriveNow, Lyft and others are examples for this trend. In parallel, the auto industry faces the trend toward autonomous driving. Several companies, including Daimler, Nissan, and others are working on models targeted toward the consumer which can drive autonomously. 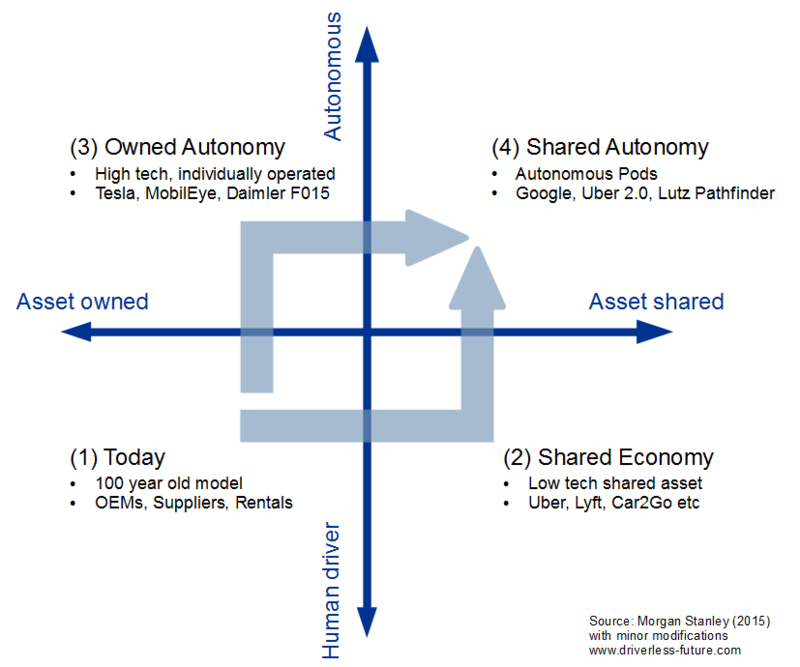 The fourth quadrant shows the confluence of both trends: The shared autonomy. Autonomous pods such as the Google electric autonomous 2-seater, the Lutz Pathfinder currently being deployed in the UK and CityMobil2 autonomous buses fall into this category. The future of the auto industry can be found in this fourth quadrant. Economic reasons clearly show that this quadrant will capture the lion’s share of individual motorized mobility. Neither of the other quadrants will be able provide individual mobility at competitive prices compared with the providers of autonomous mobility services of quadrant (4). Of course the other quadrants – particularly the 1st and third quadrant will not disappear entirely. There will still be some privately owned cars but they will represent a much smaller share of the mobility market than today. Adam Jonas conclusions about the future of the auto industry are in line with the scenarios I have outlined over the past years in many articles – including five years ago in my first paper on this topic: ‘Autonomous cars: The next revolution looms‘ . This entry was posted in Economic issues, Impact of driverless cars by Dr. Alexander Hars. Bookmark the permalink.